The Massachusetts Democratic Party released a video ad Thursday morning that attempted to tie popular moderate Republican Senator Scott Brown to the Mitt Romney campaign, in the aftermath of a PPP poll that shows Brown leading his Democratic challenger Elizabeth Warren by 26 points among independents. 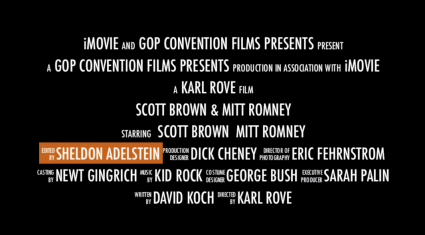 The parody ends by rolling fake credits announcing that the video was "a Karl Rove film" written by David Koch. Unfortunately, the Democrats misspelled the name of the faux-movie’s producer. A screengrab of the original credits screen identifies "Sheldon Adelstein" as having the produced the mockumentary. The Massachusetts Democrats subsequently changed the name on the credits screen to "Sheldon Adelson," the correct name for the GOP donor tied to Romney. 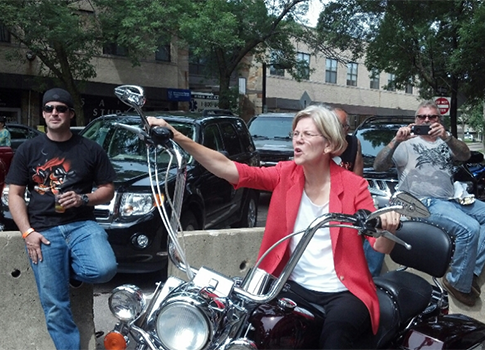 This entry was posted in Politics and tagged Congress, Elizabeth Warren, Patrick Howley, Scott Brown, Sheldon Adelson. Bookmark the permalink.